Born in Brooklyn, New York, Al Farrow has lived in the San Francisco Bay Area for more than thirty years. 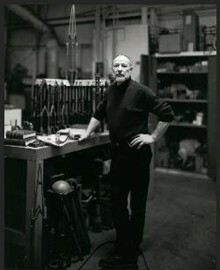 An accomplished sculptor in a wide variety of media, Farrow generally adopts the language of a particular historical period for his work, updating the imagery or material to make cogent observations about contemporary society. One particularly notable project was a set of bowls created in the style and method of the Mimbres people, an indigenous culture in what is now Northern and Southwestern Mexico. For this body of work Farrow meticulously painted in their traditional style, using a single reed brush to render images of B-1 bombers, tanks, radiation symbols, and other military imagery. In recent years he has used munitions—bullets, guns, hand grenades, bombs—to make three-dimensional projects that resemble Christian reliquaries, Islamic mosques and Jewish synagogues. Most recently, Farrow’s travelling exhibition, Al Farrow: Wrath and Reverence debuted at The Forum Gallery, New York in 2015, and traveled to the Crocker Art Museum in Sacramento, CA. The exhibition exhibits at 21c Museum Hotel (Louisville, KY) through September 2016, continues to the Bellevue Arts Museum (Bellevue, WA) and the Art Museum at University of Wyoming (Laramie, WY) in 2017, The McKinney Avenue Contemporary (Dallas, TX) in 2018, and ends back in San Francisco at the Museum of Craft and Design in 2019. A monograph, published by Crocker Art Museum, accompanies the exhibition. In 2008, Farrow’s work was the subject of a solo exhibition at the de Young Museum, San Francisco Fine Arts Museum, which was curated by Timothy Anglin Burgard, and accompanied by a monograph also published by the museum. Farrow’s work is included in the public collections of the San Francisco Museum of Modern Art (San Francisco, CA); the San Jose Museum of Art (San Jose, CA); 21c Museum Hotel (Louisville, KY); the de Young Museum, Fine Arts Museums of San Francisco (San Francisco, CA); and the collection belonging to the government of the State of Israel. Farrow has had solo exhibitions at AEROPLASTICS contemporary (Brussels, Belgium) and Forum Gallery (New York, New York). Farrow has exhibited with Catharine Clark since 1994 and is also represented by galleries in Washington D.C. and Brussels, Belgium.